We love getting feedback and questions from you, our readers. One of the hottest topics in our inbox and on our social media channels is about bedtime reading routines. Not surprising, as it’s one of those staples from childhood that has stood the test of time, from generation to generation. I imagine (perhaps naively) families gathered around candlelight reading aloud together from treasured books centuries ago, and I know many parents still make reading together at night before bed a daily priority, even in the era of screens. But that doesn’t mean bedtime reading always goes smoothly, or that there aren’t phases of life when it feels like more of a hassle than a habit. I know this all too well. 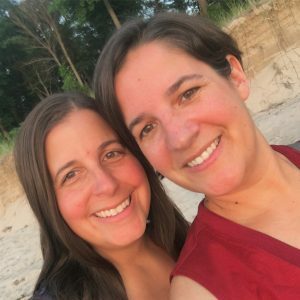 My husband’s travel schedule means I’m often juggling bedtime by myself night after night, and I suspect many of you do as well. For me, having a simple, predictable structure to our bedtime reading routine is the only thing that keeps me sane at the end of a long day. 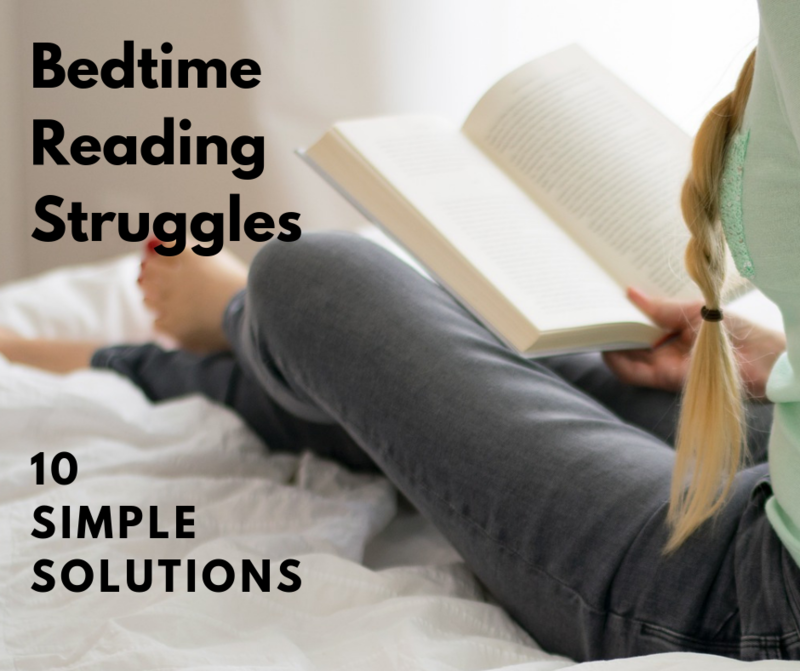 We’ve outlined three common struggles, and a few solutions for each that might help your family settle into a calmer, more fun and functional bedtime reading routine. Keep some simple fidget toys or notebooks for doodling by your child’s bed. My 7 year-old loves to play with a couple of Lego minifigures when I read aloud to him. I find he actually is able to pay better attention when he has something simple to release some energy while also listening to story. Try different seating options. If your child is reading to you and is having trouble laying still in bed, think about allowing them some movement while they read. Reading while bouncing on an exercise ball, for example, may work well. Bedtime reading doesn’t have to take place in bed. Incorporate movement into your bedtime reading. For example, do some fun stretches before, during, or after you read together (mimicking animal movements is always a crowd pleaser). Or try out books that involve movement. End with conversation. Active kids love knowing they’ll get a chance to chat with you after the book. Or pause a few times throughout to talk about what you’ve read so far and predict what might happen next. This one-on-one conversation may go a long way toward calming your child down and getting them mentally prepared to fall asleep. We’ve got lots of tips for engaging in meaningful conversation about reading here. Take turns reading. After a long day of school, after school activities, dinner, chores, homework, etc., your child’s brain may need more breaks than usual at this time of day. Even when they’re working on independent reading skills, it’s still very appropriate for adults to read every other paragraph or every other page to them. Choose easier books. If you find this is a difficult time of day for your child, don’t push them over the edge with a challenging book. Think light, fun reads at night if your child is often tired in the evenings. For babies and toddlers that really struggle in the evenings, books with simple illustrations and sentence structure are key to making this a more pleasant time. Keep it short. Find other times during the day to incorporate reading to make up for shorter bedtime reading. My oldest child often reads while eating cereal at breakfast, especially when he gets home late from practice the night before and doesn’t feel up to much reading then. Gear a read-aloud toward the youngest child. Don’t force older kids to join in, and you just may find that they do so anyway. They may have forgotten how much they loved old favorites or they may just enjoy the calm snuggles as a family. And if they opt not to join, respect that. Read quick snippets of books together before older children move on to their own books. My family has slowly worked our way through reading a quote from 365 Days of Wonder for the past year each night. It only takes a few moments, then we discuss the quote together, and then I do further reading with both children separately. It gives us a nice balance of together time, while still providing individual attention at their level. Bedtime reading doesn’t have to look like scenes from a movie to be effective and enjoyable. If you flew a drone from house to house in a neighborhood, you’d find a very different bedtime reading scene playing out at each house, and sometimes, from night to night. Don’t be afraid to mix up the routine from time to time to find what works best for you and your children. Children outgrow certain reading habits almost as quickly as they do clothes! Like this topic? You’ll find more posts with practical reading tips here.